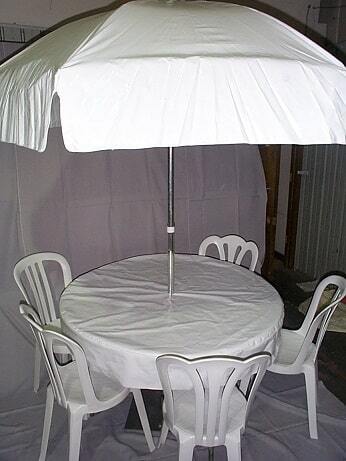 This tablecloth has a hole sewn into the center of it to accommodate an umbrella. We also carry round umbrella tablecloths in red and white gingham which are rented separately. All of our linen comes to you clean and pressed and the only items which could incur additional charges would be wax, burns, holes, or unusual stains. SKU: PFD02. Categories: Party & Event, Linens/Tablecloths, Round Linens. Tags: round linen, round tablecloth, umbrella linen, umbrella tablecloth. This umbrella tablecloth has a hole sewn into the center of it to accommodate an umbrella. We also carry round umbrella tablecloths in red and white gingham which are rented separately. All of our linen comes to you clean and pressed and the only items which could incur additional charges would be wax, burns, holes, or unusual stains. This is a homeowner type center pole canopy that can be easily installed by 2 strong people in less than an hour. This canopy requires an open area of at least 30′ x 40′ in which stakes can be driven. This style canopy must be set-up in grass or dirt where stakes can be driven into the ground. This type of canopy is safe in winds up to 20mph. If winds exceed 20mph, this tent MUST BE TORN DOWN. This type of canopy cannot have sidewalls attached to them. No cooking or grilling can be done under this or any canopy. All Seasons Rent All does not offer set up or tear down of this type of canopy. Dinner napkins are 20″ x 20″ and are available in a huge variety of colors. All of our linen comes to you clean and pressed and the only items which could incur additional charges would be wax, burns, holes, or unusual stains.